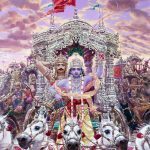 The Supreme Personality of Godhead Sri Krishna has very elaborately described the constitution of the soul in the previous chapter, with a view to delivering His intimate friend Arjuna from the ocean of material grief. And the path of realization has been recommended: buddhi-yoga, or Krishna consciousness. Sometimes Krishna consciousness is misunderstood to be inertia, and one with such a misunderstanding often withdraws to a secluded place to become fully Krishna conscious by chanting the holy name of Lord Krishna. But without being trained in the philosophy of Krishna consciousness, it is not advisable to chant the holy name of Krishna in a secluded place, where one may acquire only cheap adoration from the innocent public. Arjuna also thought of Krishna consciousness or buddhi-yoga, or intelligence in spiritual advancement of knowledge, as something like retirement from active life and the practice of penance and austerity at a secluded place. In other words, he wanted to skillfully avoid the fighting by using Krishna consciousness as an excuse. But as a sincere student, he placed the matter before his master and questioned Krishna as to his best course of action. In answer, Lord Krishna elaborately explained karma-yoga, or work in Krishna consciousness, in this Third Chapter. In the third chapter, action offered to the Lord without personal desire is described. Discrimination with a desire to conquer over lust and anger is shown. 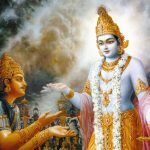 Having surrendered to the superiority of bhakti which is transcendental to the gunas, over jnana yoga and niskama karma yoga in previous statements, here, manifesting his own desires, Arjuna in a friendly manner censures the Lord who is encouraging him to fight according to his dharma. If fixed intelligence (buddhi), bhakti, transcending the gunas, is superior (jyayasi), then why do you engage me in this terrible action in the form of war? O Janardana, by your order you are causing pain (ardana) to your own people (jana). It is also not possible to avoid following your order, O Kesava, controller of even Brahma and Siva! Ka means Brahma, Isa means Siva, and va means vayase, you control. 3.1 ‘Arjuna said — If you consider that knowledge is superior to works, why do you engage me in this terrible deed?’ What is said here is this: If the firm adherence to knowledge is the only means to the vision of the self, then how can one accept the idea that devotion to works (Karma) leads to it? It was said before that this firm devotion to knowledge, which forms the means for the vision of the self, could arise by the cessation of the activities of all the senses and the mind in relation to their respective objects such as sound. If the vision of the self is to be attained, which arises by the cessation of the activities of the senses, I should be guided to engage myself solely to acquire firm devotion to knowledge, which is preceded by the abandoning of all works. For what purpose, then, do you engage me in this terrible deed, which consists in the activities of all the senses, and is thus an obstacle for the vision of the self? Commencing in chapter two, verse eleven Lord Krishna instructs Arjuna that he is lamenting for what should not be grieved for. A pattern has been set in motion that gives a sense of discrimination between the soul and the physical body and has been instructed as a way to attain moksa or liberation. So jnana yoga or a requisite mentality towards the soul has been taught, now learn how to apply this in respect to requisite activities in karma yoga as was explained beginning in chapter two, verse thirty-nine. Although jnana yoga and karma-yoga have been explained in detail, the relationship between the two has not been established as to which is superior and which is subordinate. 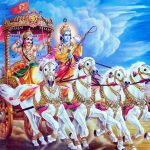 In regard to discrimination and the cultivation of spiritual knowledge and being informed that they lead one to moksa or liberation; Arjuna came to the conclusion that Lord Krishna valued this path to be superior to karma yoga or the path of actions. 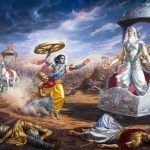 But if this was true then Arjuna was bewildered because he did not understand why Lord Krishna was urging him to engage in a ghastly, horrific war by repeatedly telling him to arise and fight. So in review chapter one introduced the setting in which Arjunaâ€™s grief and lamentation arose as an apparent cause for spiritual instructions from the Supreme Lord Krishna. Then in order to remove this grief and lamentation in chapter two Lord Krishna reveals the eternal nature of the soul, the discrimination between body and the soul, karma yoga, the path of actions without attachment, jnana yoga the cultivation of spiritual knowledge and the restaint of the senses, taking refuge of the Lord, equaninity of mind and the attainment of moksa or liberation have all been delineated. Thus the essence of Srimad Bhagavad-Gita has been presented in chapter two in a condensed form. The remaining sixteen chapters should be understood to be an extension of the topics discussed in chapter two. Here in this verse Arjuna is thinking that he was blamed earlier in chapter two, verse 11 for lamenting for those who should not be grieved for. 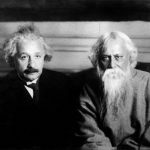 He was subsequently tutored in jnana yoga, the path of knowledge to alleviate this error. Now Lord Krishna is presenting a way to allieviate this error from the point of view of karma yoga, the path of actions without attachment. In chapter two, verse thirty-nine he is told he has the right to perform actions but not to desire the fruit of action. In chapter two, verse forty-seven and forty-eight he is instructed not to be attached to inaction and perform duties with equanimity, respectively. Then in chapter two, verse fifty-three he is told how the mind becomes in this state. Then from verse fifty-five until the end of the chapter two Lord Krishna gives the proofs to show the superiority of the cultivation of spiritual knowledge which leads to the ultimate truth in the last verse of this chapter where once one having attained even at a second before death attains liberation from the material existence. But in spite of these instructions Arjuna was still being instructed to arise and fight. These seemingly contradictory instructions caused some confusion in Arjunaâ€™s mind that he was anxious to have the omniscient and omnipotent supreme Lord Krishna dispel. arjunaḥ uvāca — Arjuna said; jyāyasī — better; cet — if; karmaṇaḥ — than fruitive action; te — by You; matā — is considered; buddhiḥ — intelligence; janārdana — O Kṛṣṇa; tat — therefore; kim — why; karmaṇi — in action; ghore — ghastly; mām — me; niyojayasi — You are engaging; keśava — O Kṛṣṇa.